Summer is finally here, #GenXYZ! It’s time to hit the beach, go on that vacation you’ve been waiting all year for, or just kick back and enjoy the sun. For many of us, summer is a time of relaxation and good weather. But for parents of young kids, it can be totally different story. Without school to keep kids busy, growing pains are even more difficult come summer time. 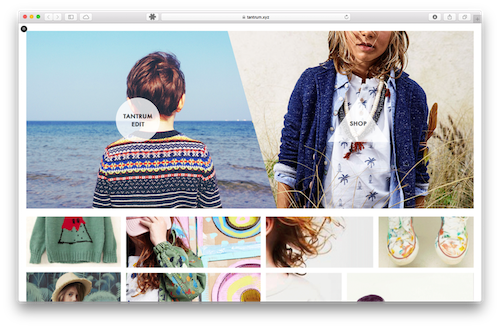 With their design-conscious focus and curation of the latest parenting trends, Tantrum.xyz is the new one stop shop for the modern parent. Their online shop includes only the most stylish apparel and accessories so that your children can feel cool regardless of how hot it gets this summer. Plus, they have an online editorial with content ranging from the recipes to activities and essential child-rearing tips/tricks for today’s modern, tech-savvy parent. When it comes to raising children, not many people stray from traditional methods and guidelines. Tantrum gives parents a universal platform to connect with other moms and dads who understand that the world of parenting is changing. They are insightful, highly relatable, and exactly what they need during a transitionary period: someone who understands what they are experiencing and can provide them a bit of relief. Tantrum fills the void and makes the twos that much more terrific. Thank you Tantrum. We’re glad you’re here. In case you missed it, .xyz launched on June 2, 2014. That means we just celebrated our second birthday last week! It has been such a terrific year so far and we’re still celebrating our birthday month with our retail partners, who are running unheard of .xyz sales for the rest of June. Don’t forget to check out gen.xyz/2 to learn more! Cheers to another terrific year.